If you’re keen on hand embroidered monograms, you’ll be over-the-moon thrilled to know that Monograms: The Art of Embroidered Letters by Susan O’Connor is back in print. For those you who’ve been hanging about here at Needle ‘n Thread for a while, you might recall my review of this delectable tome! As you can see, the cover is decidedly different. But the contents are the same! To get a thorough run-down of the contents of the book, you can read my earlier review, if you’d like. It’s thorough, and it goes into all the lovely, nitty-gritty details. 1. The first part of the book, on the history of monograms and decorative initials and topics like how letters are arranged, is excellent. It makes good reading and good background information for pursuing the art further. 2. The techniques are well-presented, and the photo instruction is very clear. You’ll find everything here that you need to get started in the art of traditional monogramming techniques. 3. 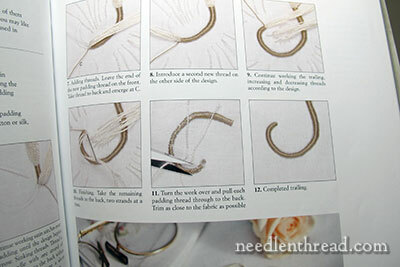 You can apply a lot from the book to other surface embroidery techniques, and especially to whitework. It’s a terrific book, and I’m So Happy that it’s available again! When it became hard-to-find, I saw it listed on used book sources for as much as $700. In any case, it’s a relief to have it available to the general public again at a Much More Reasonable (and affordable) price. Worldwide, you can order Monograms: The Art of Embroidered Letters through Book Depository, with free shipping worldwide, for $31.35. US readers will usually receive books from Book Depository within about 10 days, and sometimes much sooner. November 15, 2012 Blissful Beginnings – A Beautiful Book of Embroidered Blankets!! Darn, I should have tried to sell my copy for $500 and given someone a deal! All joking aside, it’s great when publishers have faith in needlework books like this to republish. I can think of a few out of print sewing pattern drafting books that go for huge amounts. 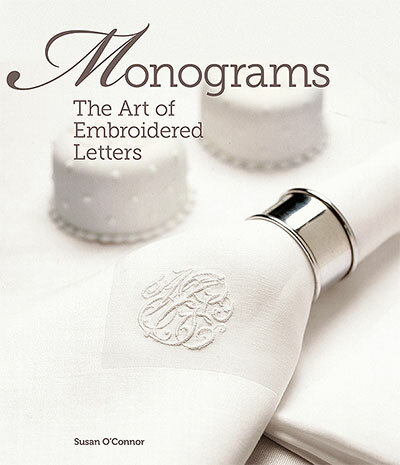 I do like monograms and It’s so nice to know that the Monograms: The Art of Embroidered Letters by Susan O’Connor is back in print it looks like a very instructional and very useful book in all kinds of ways. I can’t believe it was being sold for up to $700 that is ridiculous. Thanks for letting us know that it’s back in print and for the links on where it is available. I hope you have a great weekend. Dear Mary, I was only reading my copy of Susan’s book yesterday. I bought it secondhand some time ago and it was worth every cent, although I paid much more than its initial publication price. Very good to hear it is again in the market place. Yay! Thanks for letting us know. Off to order a copy. Hi Mary. I got my copy in the mail yesterday. I had ordered it way back when you first reviewed it, but I was told by the publishers that they didn’t have a reprint date. I hung in there, though – in fact, I had pretty much forgotten about it – but when I opened my mailbox yesterday and saw the envelope, I knew immediately what was in there! It is a lovely book lovingly put together, with great illustrations and steps. I’m looking forward to perusing it in detail. Mary, I received my copy of The Art of Embroidered Monograms just recently and it is absolutely beautiful. There is so much information inside and the pictures are very clear. This was a birthday gift and I am so grateful to have received it. Thank you so much for sharing this with all of us. Oh, Mary! I was so excited when I read your newsletter and immediately placed my order for this book. Ever since I read your first article on it, I’ve been looking for a copy, hoping it would be available soon. I look forward to receiving my copy and delving in with needle & thread. I have this book and it is absolutely wonderful. I heartily recommend it to all who love monograms. As is typical of Country Bumpkin publications, the illustrations are superb and the instructions very easy to follow. I guess I was lucky – I bought my copy when it first came out. My favorite embroidery is white work and monograms. I’ve made three heirloom christening gowns with lots of white work and pretty decent monograms. I really, really, Really wish that you would do a project doing white work that would incorporate a monogram. I had my dreams dashed when you didn’t do the magic garden project in white work using silk! Just so you know ,I have tons of these in stock !